Y’all, I did it! Remember how my studio looked on Thursday? In full disclosure, I also said I’d start on Thursday, but I didn’t. I have no idea what I spent the day doing, but it probably had something to do with dreaming about and planning my carport that will be built very soon (barring any unforeseen circumstances). And then I didn’t tackle it on Friday either. I generally take Fridays off, so I didn’t feel too bad about that. Then on Saturday, I planned to really buckle down and get busy in here. I finally got started at 3:00 that afternoon. And yet, somehow quite miraculously, I was still able to get it all cleaned out (with the exception of a few items here and there that I can’t find spaces for elsewhere) by about 5:00 yesterday. I had hoped to get started on the electrical today with my brother’s help, but we’ve postponed it until tomorrow. I just wasn’t feeling prepared, and this is something I don’t want to rush. I feel completely confident in my electrical wiring abilities. But the part that makes me nervous is all of the decisions that have to be made way before the actual wiring can even start. How many circuits will be needed for these rooms? What will go on each circuit? Where exactly do I want the lights? And where will the lights be switched? Do any of these need to be three-way switches? What about electrical outlets? Have I considered everything I’m going to need? Have I forgotten something crucial (like adding exterior outlets)? And what will I be using them for? Should they be divided onto two circuits, or is one circuit enough? How many of each item will I need to purchase? And what am I forgetting? All of that preliminary stuff is enough to send my perfectionist tendencies into overdrive and get me perpetually stuck in the planning/revising/tweaking phase. But I’ve given myself a deadline to get it all figured out and get to Home Depot with my shopping list today by 5:00. That’ll give me time to get home, organize my tools and Home Depot purchases in the room, and maybe even get some junction boxes put into place before I go to bed tonight. That way, we’ll be ready to go tomorrow morning when my brother gets here. 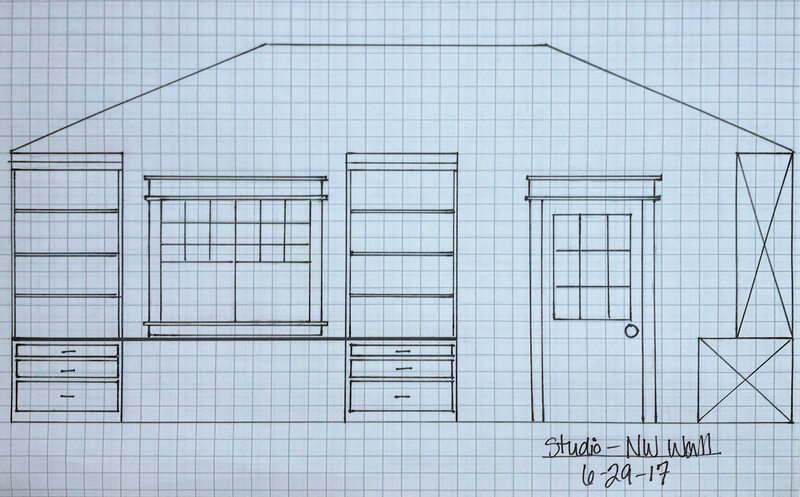 But it’s been a while since I’ve talked about the plan for the studio (I think), and some of you who are just tuning in may have missed it, so let’s review. Here’s a floor plan for reference. This is the side wall of the studio. The window looks out to my neighbor’s house, and the door is the one with the portico over it. This wall will be my “office” area, with a floating (i.e, not built in) desk and built in cabinets on the wall. This is the front wall of the studio. The windows look out towards the front yard and what used to be the driveway area. This whole wall is going to be built-in cabinets and one large desk area where I can spread out and work on projects. And in the future, if I ever decide to hire someone to work alongside me on my blog and any other endeavors, this can be their desk space. The wall to the right of the above built-in cabinet and desk area is where I plan to park my rolling workroom table when I’m not needing it pulled out into the room for big projects. 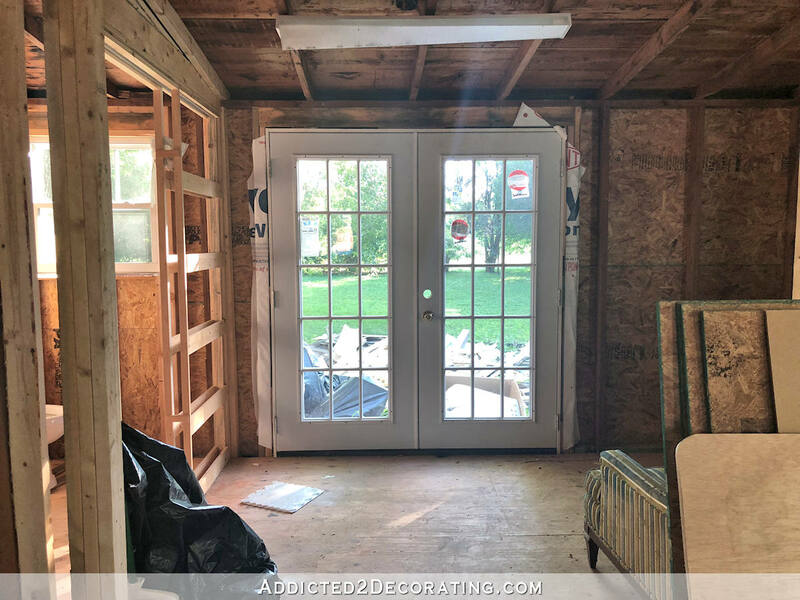 This back area, with the French doors that look out towards the back yard (and my ever-growing trash pile 😀 ) is the area that will see a big transformation when the carport is built. See how low the ceiling is above the doors? That wall is right at seven feet tall, and it makes this back area feel very closed in and cave-like. It’s much better now that there’s lots of light coming in, but when it was a closed in storage room, it was awful. But even with all of the light, I still don’t like it. I also don’t like that it’s not built correctly. Whoever built this area used a single 2 x 4 as the top plate of the wall. Top plates on walls are supposed to consist of two 2 x 4’s. So when the carport is built, all of this will be corrected. The wall will be raised to a standard eight feet, and the new top plate will be built correctly. Last Friday, I also mentioned that the addition of the carport, the removal of this flat roof, and the addition of a new (much taller) roof that will be tied into the original roof might also fix one more problem that’s been bugging me. I was talking about this mess of ductwork for the HVAC system, and especially that one coming out the side. 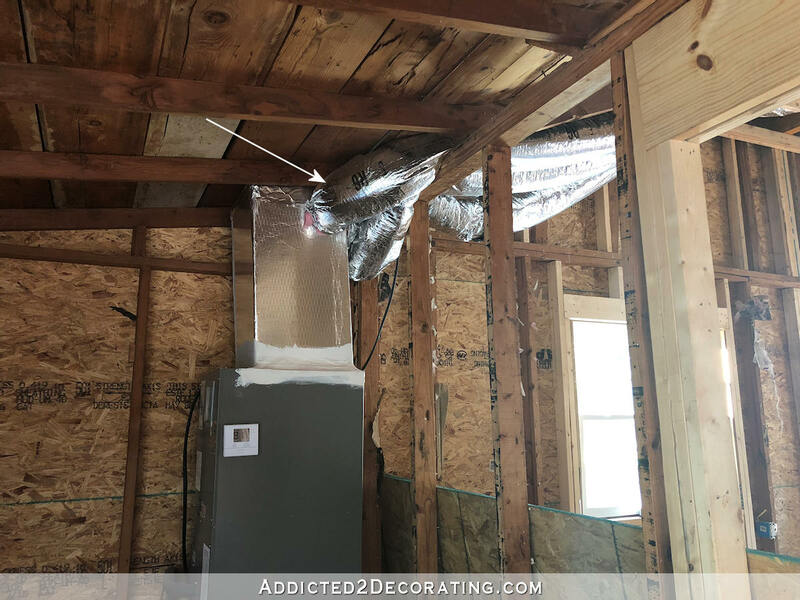 Since this area has no attic space at all, there was really no other option for the ductwork. 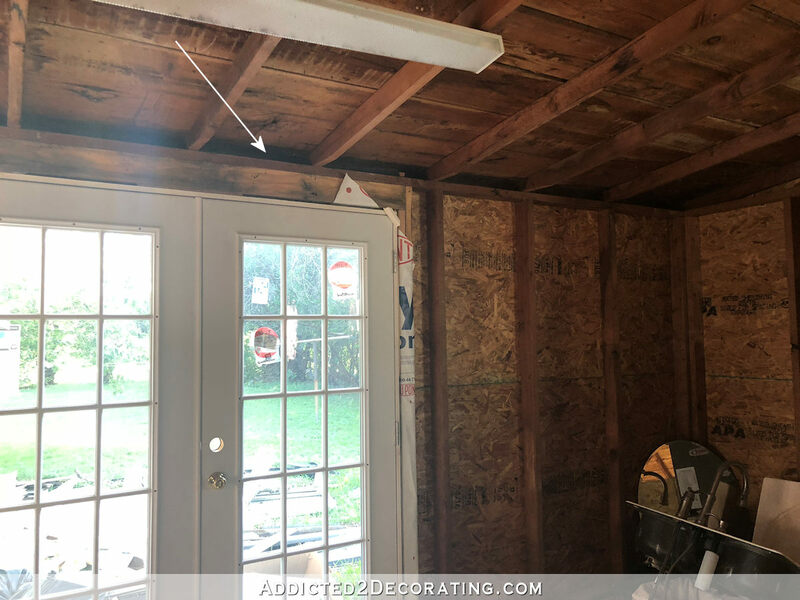 The problem is that the one coming out the side extends past where I want to put a wall and a pocket door to create a closet at that end of the space. I’d have to build a separate box sticking out from the wall to enclose that duct, and I’ve just been dreading it. 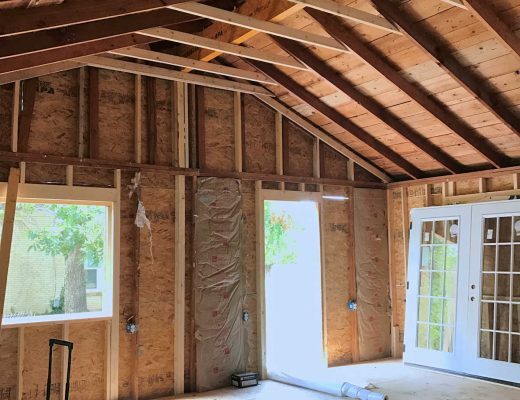 But now that this low roof will be removed, and there will be some space above the ceiling joists with the new roof, I’m hoping and praying that there might actually be enough room for the ducts (or at least that one duct) to go straight up instead of sticking out to the side. That would sure make things easier (and prettier) for me. So yay! I’m actually making progress! I almost have my electrical plan finished. I just need to go over it again (or twenty more times 😀 ) to be sure I’m not forgetting anything. I’m excited to get started on it tomorrow! Super exciting! Glad you got that cleaned up and are moving forward! You just needed an incentive, so entire plan came together with carport. BTW, dog looks like he is doing really good. He’s bigger than I thought. Bigger than I thought too! Thirded! He looks like he’s filled out nicely, too. I like that Peeve is just relaxing on the sofa and not at all alarmed to have a big dog so close to her; it appears they get along well. When I am working in my sewing room, I have often wished for an electrical outlet over my work table. There are times when I need to press (iron) large things, so I work on the larger cutting table centered in the room and have to use a long extension cord on the iron. Other times, I might wish to use my electric scissors on that table, and while they are cordless, they have MUCH more speed and strength if you use them plugged in. MY POINT: While I would NOT want a cord hanging from the ceiling all the time, it would be wonderful to have a plug in the floor so my work table could be wired with outlets. Even a mobile table could be plugged in when needed, increasing the functionality of the space. If a floor plug is NOT an option, a ceiling plug might be considered. Just a thought! I am so happy for you. I really feel that once you have a “home” to work on all of your projects, that is not inside your house, you will be so happy. 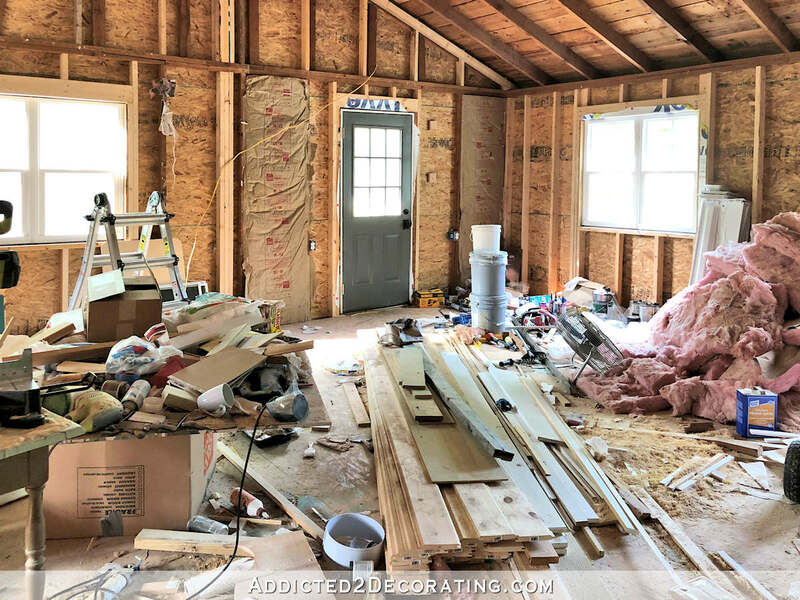 I cant wait to see your finished workroom. It’s so exciting when things come “unstuck” and you can see your way forward. So frustrating cause we often can’t see what has us stuck until the answer….. your carport shows up….and then woohoo we are off to the races. Have to admit I have a little workroom envy😳. Can’t wait to see it finished! Real progress, Kristi. I would give almost anything to have a video replay of how that cleanup day went. It must have been wild. You accomplished wonders! Proud of you. Once again, yay you! You are an inspiration to me every single post! Floor outlets are great. Especially where you are planning your desk. 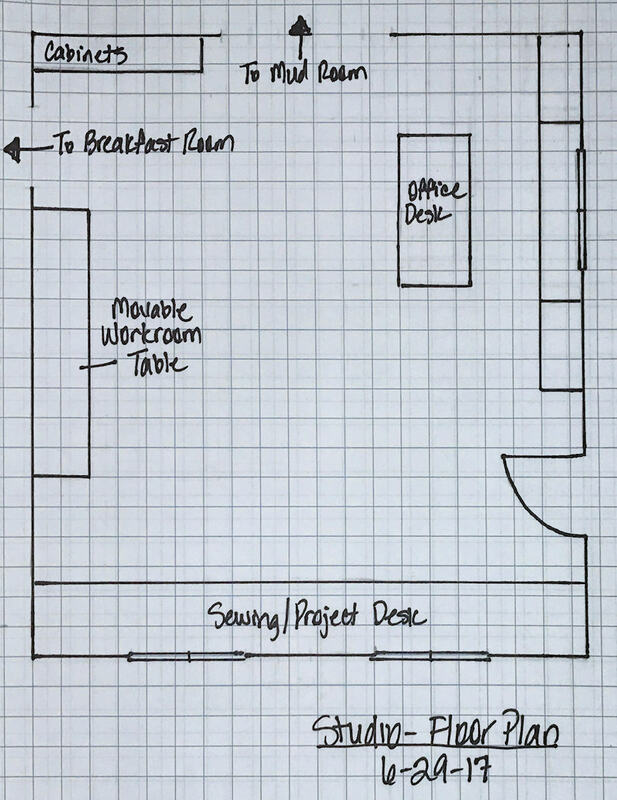 If your desk is away from a wall as in the drawing… would you install a floor outlet for a lamp or connecting a laptop to power? Wow! I could use a dose of your ambition. It looks like your plan is on track now. My advice is don’t skimp on the outlets and make sure you add a couple of them outside. Also, I’m wondering if you need to get permits for electrical work and/ or need an inspection when you are finished. 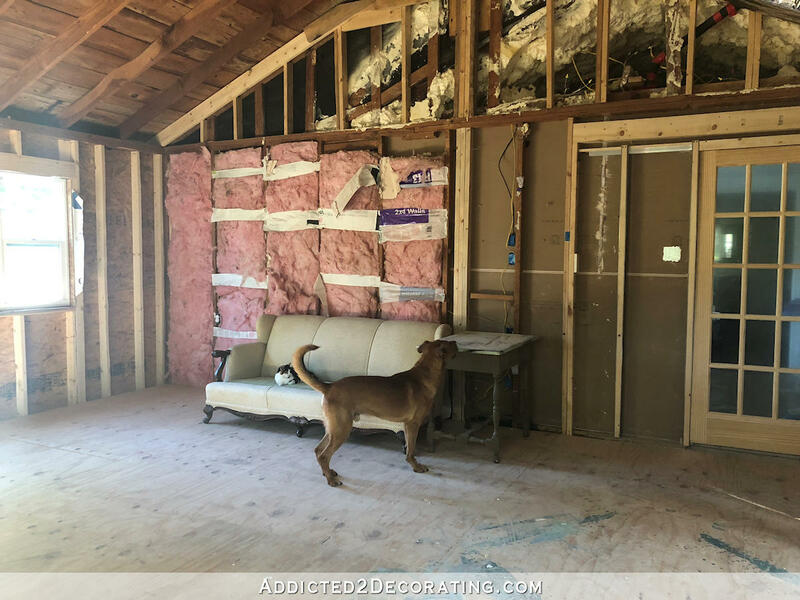 I’d hate to see you blindsided after the drywall goes up! I am new to this site and I so love all your “explain as you go” information. I fully understand the plug that was pulled when you began the clean up of the room. It is like a gush of wonder and action that just keeps you going. Happy to be here and happy to follow you thru your latest endeavor. Man oh man…you were a whirlwind! Awesome great news on all fronts. Am so happy for you to get this done. 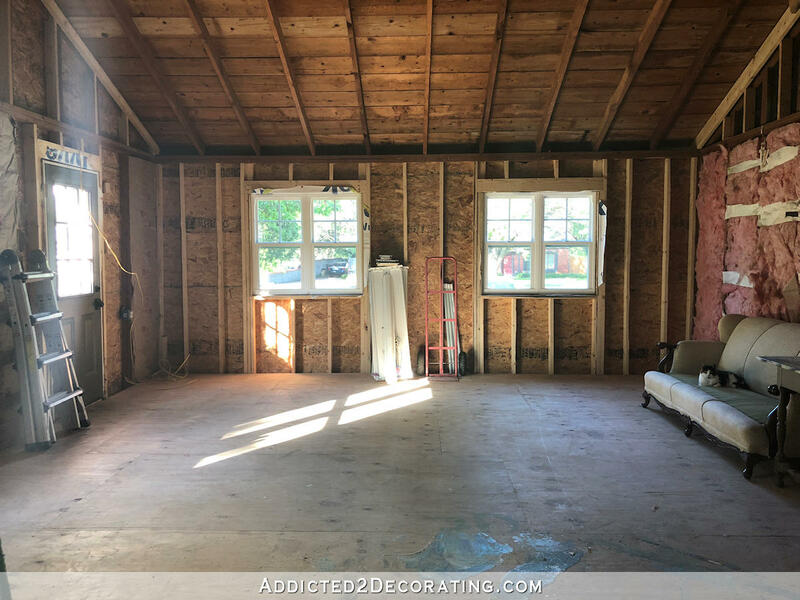 What a transformation to see that room cleared out! Happy day with brother tomorrow! What a gift he is to you! Tell him I said so! 🙂 And Matt is the best husband on the block getting you motivated (along with the readers here) tell him I said so. And now that you have your TED talk humor you can forge ahead. Hoping all of our “you can do it’s” gave you a little push and inspiration to get the project tackled. Good job! Wasn’t even as bad as you thought, huh?😋. This is great advice to buy it/return it later if you can’t use it. 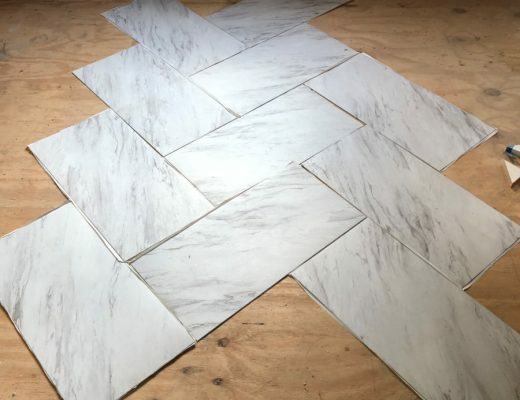 Was with a friend shopping for a rug, she found something she loved and though it was the perfect size, but wasn’t 100% sure about the measurements. I told her to buy it now — we were at the store already, she’d loved it, the rug was in stock and in the size she was pretty sure she needed, and she’d have to go back to the store *anyhow* if she got home and got the measurements exact. Turns out her eye was better than she thought, the rug fit perfectly when she got home and I got credit for logical reasoning! 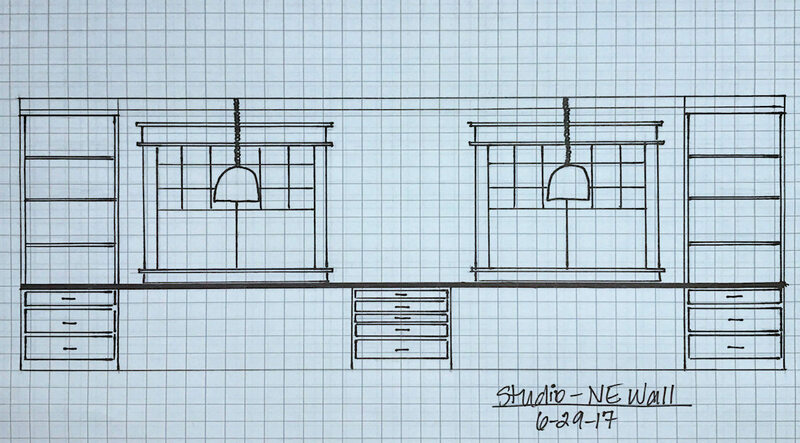 Consider putting 3 pendant light fixtures instead of 2 in front wall desk area. It will allow you to use lower wattage light bulbs and cut down on shadows on your work surface after dark. Consider outlets with USB plugs and regular plugs at the desk top height and regular plugs floor height in this area. Great plans! Such a useful room, I’m excited to see your vision come to fruition! I second the recommendation to use USB outlet plugs at least in the two built-in desk areas. That would be great for you and a future assistant! Very exciting stuff going on in your studio! Can I just say I’m totally jealous of this space as it makes my little corner of the basement look puny. So with the addition of the carport at the back, will you be repurposing those pretty french doors in another area of your home? Happy Wiring! We have designed and built two houses in our married life. A few additional comments about switch receptacles and outlets. 1. Make sure you take account of the door swings. I am still haunted by the misplaced switch to our son’s room, which ended up behind the bedroom door. And we haven’t had that house for 18 years! 2. Make sure you are putting in lots of outlets above your counters and also below. You will likely want more than code requires. 3. Be sure there are outlets on every wall! In our current house, which was a spec house, there is one wall in our breakfast room area which has no outlets! I have a small desk there, but only pile up mail and things to be filed, because I cannot have a lamp there nor plug in my laptop or phone chargers. Makes the space fairly useless. 5. Lighting is so important in a space like this. You will want not only good, shadowless lights from overhead, but also lamps or some sort of desk task lighting at those areas where you will be seated and working. 6. Regarding outdoor receptacles, in addition to the usual low ones, consider putting some in up high, at the level of the eves, if you are ever inclined to up Christmas lights. When we build our next house, I plan to do this. Also inside, above the kitchen cabinets, where I put fresh greens and white lights, because now I have to put up with an extension cord down to one of my kitchen outlets. When you do this, consider wiring it to a switch inside, and perhaps one with a built in timer. Auto on and off for the outside lights, without having to run around outside in the cold and rain. 7. 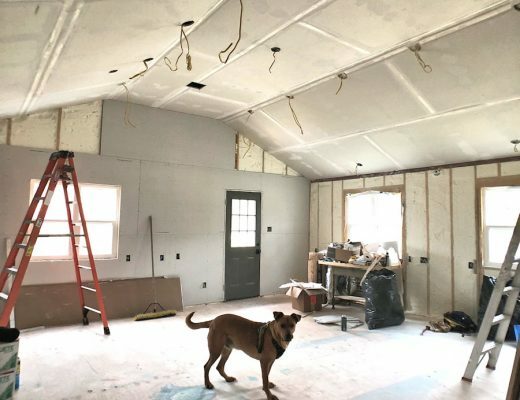 On the issue of heating and air duct work, have you considered an alternative to running them up high and having the vents up high on the walls? I am assuming that your studio is built on a slab, not a raised perimeter foundation, but have you considered asking a heating and air contractor if there is a way to bring the ducting down to floor level, and building some sort of baseboard level registers? On the cabinet walls, you would be able to run that through the kick space of the cabinets, then vent them out there. Having lived in an apartment in college that had high ceilings like your studio and had the heating vents up at the eight foot level, I can tell you that they are very inefficient, and we ran the furnace forever to try to heat up the lower section (where the people were). 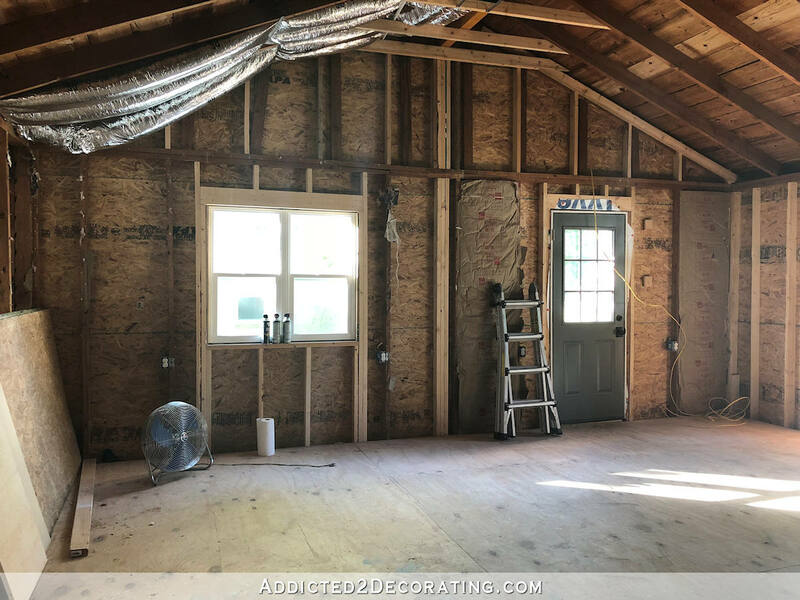 It is so much more comfortable to have the vents in the floor (not possible on a slab) or in the lower part of the walls, or in the kick spaces under the cabinets. Just curious…will you need to get the electrical work inspected after you’ve finished before you insulate & then after wallboard is put up? Gonna look great! P.S. I love that couch waiting for recovering, lol! You certainly got your exercise over the weekend!! I’m happy things are going your way. looking forward to seeing your progress! I am somewhat jealous of all this “wonderful” space. I’ve downsized to a townhouse and even tho it is more than ample room for me it just would be so nice to be able to spread out 🙂 Love your plan for this space – you’ll enjoy it so much. Keep up the good work! Kristi, this studio space is going to be AMAZING! I wish I had a space like that, I’d probably just live in it all the time! I canNOT wait to see it finished, it’s going to be EPIC!